Google Reader has always allowed you to share collections of feeds: you can add the feeds you want to share to a folder, make the folder public and get a public page that shows the latest items from the feeds. Other people could subscribe to your public page in any feed reader or they could download the OPML file and import it in a feed reader. The problem with this approach is that it's not very easy to find, the OPML file is there only if you know how to obtain the address and you need to keep the folder even it's no longer useful to you. Bundles are a more transparent way to create collections of feeds: you'll find them if you click on "Browse for stuff" in the sidebar. 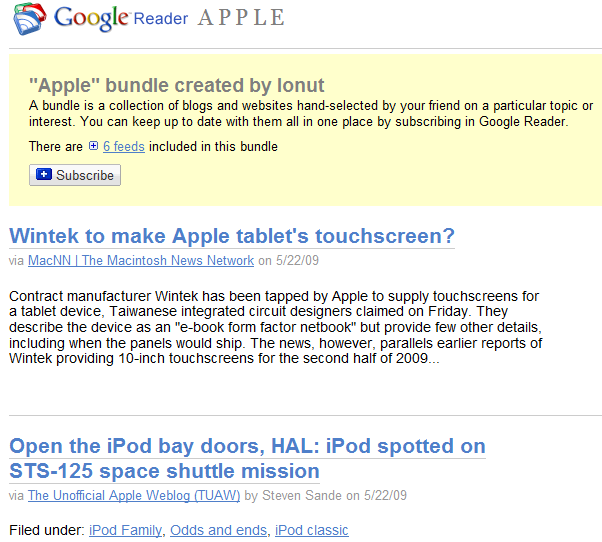 Google Reader already offers 447 themed bundles for "Mindmapping", "Pop-culture", "Startups", "Food blogs", "Architecture" and other topics. The nice thing about bundles is that you can subscribe to a list of hand-picked blogs with one click. Now you can create your own bundle from the same page: just select a name and drag 5-10 feeds from your subscriptions. They don't have to be perfect, since you'll be able to add more feeds later. After creating the bundle, Google Reader will generate a page that looks like the shared items page, but it has a explanatory description, the list of feeds that are mixed and the most recent items from the feeds. You can subscribe to the bundle by clicking on the "Subscribe" button if you use Google Reader or by exporting the bundle as OPML and importing the file in a feed reader. The bundle's name will become a folder and all the feeds will be added to that folder, an improvement over the public folder approach, where the collection is mixed in a single feed. 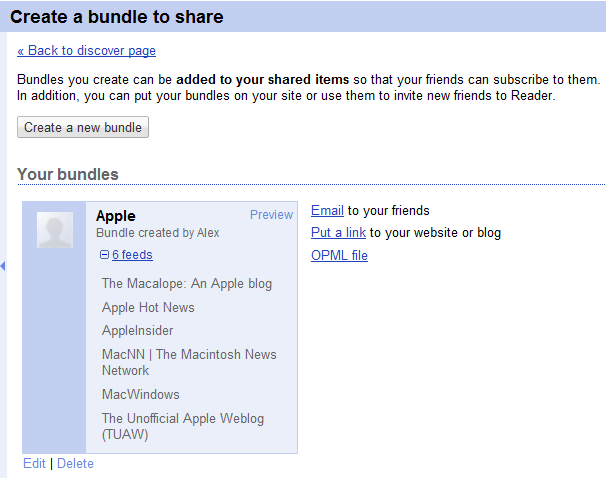 Here are two examples of bundles: Apple and Google blogs.